A DC-area legal activist has filed a federal human rights complaint against the Catholic University of America (CUA) for acting “probably with malice” against Muslim students for having Catholic imagery in all of its rooms that would hinder Muslim prayer – though the school says it has never heard a complaint from the students themselves. John Banzhaf, a George Washington University Law School professor who has a history of filing suits to promote agendas on such topics as childhood obesity and tobacco, filed the complaint with the Washington, D.C. Office of Human Rights, Fox News’ Todd Starnes reports. Banzhaf is the same activist who filed a lawsuit against CUA president John Garvey last month for transitioning the college out of co-ed dorms, which he also called a human rights violation. 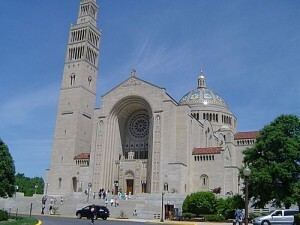 Starnes notes that part of the complaint mentions that Muslims had to pray at the school’s chapels “and at the cathedral that looms over the entire campus – the Basilica of the National Shrine of the Immaculate Conception.” The same phrase appears in a Washington Post article from December 2010 that noted CUA’s refusal to authorize a Muslim group despite a growing number of affiliated students, as opposed to more liberal Catholic campuses where such groups are allowed, such as at Georgetown University. The Post article, which interviewed several Muslim students, found none of them critical of CUA’s attitude towards their faith, and many of them complimentary. One student said his Islamic faith had matured for the better amid the welcoming campus culture. A spokesperson for the Office of Human Rights told Fox that the investigation based on Banzhaf’s 60-page complaint could take as long as six months. Patrick Reilly of the Catholic university watchdog group Cardinal Newman Society told Fox that the complaint was an attack, not a defense. Thomas Peters of CatholicVote.com and the American Papist blog noted that, while the complaint seemed outlandish, the climate against religious freedom in Washington may be fatal. “Normally I would have confidence that this lawsuit will be deemed without merit, but the way things are going these days, I just can’t be sure anymore,” he wrote. I’m wondering, then, how there could be an Islamic connection. If anyone is for segregating the sexes it’s the Muslims. I thought you had to have legal standing to bring a lawsuit? !